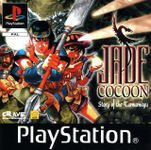 Enter the world of Jade Cocoon: Story of the Tamamayu. As Levant, a Cocoon Master, you will engage powerful monsters in deadly one on one combat. As the magic and talon clashes of these battles turn to your favor you can call on the mystic cocoon powers and capture your fallen foe. Once captured these mighty creatures will be the key to unlocking the curse that has overcome your village. •Custom combine captured creatures into millions of powerful new monsters. •Beautifully rendered backgrounds create a world rich in texture and tone. •Pit your creation against a friend in arena mode.